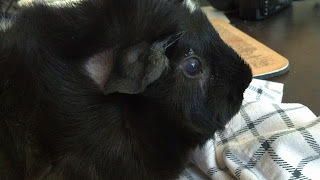 Late yesterday evening our piggy mom went to pick up Revy when she noticed something wrong with her right eye. The half of her eyeball closest to her ears was cloudy and the whites of her eye were red. A closer inspection revealed the apparent culprit, a thin strand of hay protruding from below the rim of her eye. Being careful not to make contact with Revy's eye, our human was able to gently pull out the offending object. The strand turned out to be 1/2-3/4 inch in length. Thankfully, Revy was still eating and acting otherwise normally so emergency syringe feeding was not necessary. Since eye injuries can result in permanent damage or eye loss if not treated promptly, the vet was called and Revy was hauled in for an exam. 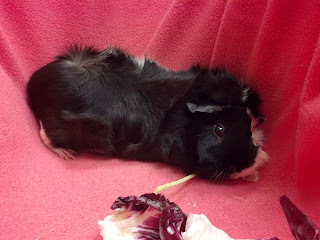 Our vet said they see a fair amount of guinea pigs who manage to lodge hay behind their eyelids. As was expected, she fussed and protested when fluorescein dye was applied. The subsequent Wood's lamp exam revealed an ulcer on her cornea under ultraviolet light. However, the real struggle started when the vet attempted to check if there was any more hay lodged in her eye. Revy shrieked repeatedly like a pterodactyl and went on a toothy rampage. Evidently she wasn't particularly enamored with the forceps. After a memorable show of theatrics Revy was prescribed antibiotic eye drops and scheduled for a recheck in one week. The drive home was quiet and uneventful. Upon her return she plodded over to her pigloo and promptly flopped down to sleep. Being a rebellious pig sure is exhausting. "shrieked repeatedly like a pterodactyl and went on a toothy rampage"
Poor Revy! Hugs and nose snuffles from me and the horrors. Feel better soon, Revy! Going to the vet is never much fun.